On December 5th, I introduced my second poetry book to the world. It is titled Wearing Someone Else’s Shoes Ain’t Never Been Me. It is a long title but every word is imperative. The theme of my book is “walking in your own shoes”, not someone else’s shoes, but your own. So, what does “walking in your own shoes mean”? I define this idiom as walking in your own identity, learning and using your own voice, finding and fulfilling your purpose, and living out the destiny God created for you to walk in. It is not a physical walk but a mental, emotional, and spiritual flow you possess all your own. You are the only you God created and although there may be people who look or act similar, no one can fulfill your destiny like you can, the way you can, if you set out to do so. I love Sarah McLachlan lyrics, from In Your Own Shoes, that says it best, “Time for you to walk in your own shoes/Lay down your footprints wherever you choose/Leave it all behind and move on ’cause you are your own woman” (or man, if you are reading this). “Walking in your own shoes” also means letting go of the baggage that has been holding you down and keeping you from moving forward. Are you walking with an enormous load or a broken heel and a broken heart? “Walking in your own shoes” too means removing the masks we often put on to appease others and keep up a facade of how we want to appear before others. What masks have you been wearing? I wrote this book, like any other books, poems, or writing I do, to get out whatever I need to sort out within and to put down on paper the things I had been learning about life, people, and myself. I wrote some of the poems years ago and the rest I wrote last year, 2015. I have been learning to grow comfortable in my own skin as well as outside of my comfort zone, and I do stress learning. It has to be true about life after 29 (do I have to tell my age, Laughing out loud) when you start to come into who you are because I am experiencing that, amidst some fear and a little anxiety. Although, I have always been goal-oriented, I would not have been able to tell you my purpose before now. I often let people chime in on what I should do and be. But thanks to my strong mom, who has encouraged me to always get off the couch and live and my pastor who impressed upon me to find my purpose and fulfill my destiny, I would not have committed time to seeking out my destiny and purpose these past few years. In this moment along the journey, I am also learning to deal with my flaws, past issues, insecurities, and emotional wounds I’ve incurred along the way. So, I too, am still learning how to walk in my own shoes. Named for its leading poem, my book, Wearing Someone Else’s Shoes Ain’t Never Been Me, poetically talks about finding your destiny, living life on purpose, embracing your God-given journey and even allowing yourself to be vulnerable (not naive and gullible, but vulnerable) and trusting God to protect you in doing so. We will talk about vulnerability another time. As always, I love to give and here are some Tools for your Journey! Walk in desperate pursuit of God. Walk (or dance) in the rain every now and then. Walk in justice and integrity. Walk alive, not like the living dead. Walk, smile, and laugh. A smile and laughter are medicine for the heart. Walk out of your comfort zone. Walk to give a hand to those unfortunate than yourself. Walk and make your mama proud. Return the love and create memories and moments for her like she did for you. Walk according to your own pace. Walk in healthy attitudes and habits. Walk in faith and trust Jesus who died for you because He has your back like no one else can or will. Walk to make an impact. Walk in the present, not the past, not the future. Walk accordingly to the plan God has for you. Walk in originality. Be yourself. Walk up to fear, knowing it’s bluffing. How have you begun to walk in your own shoes? 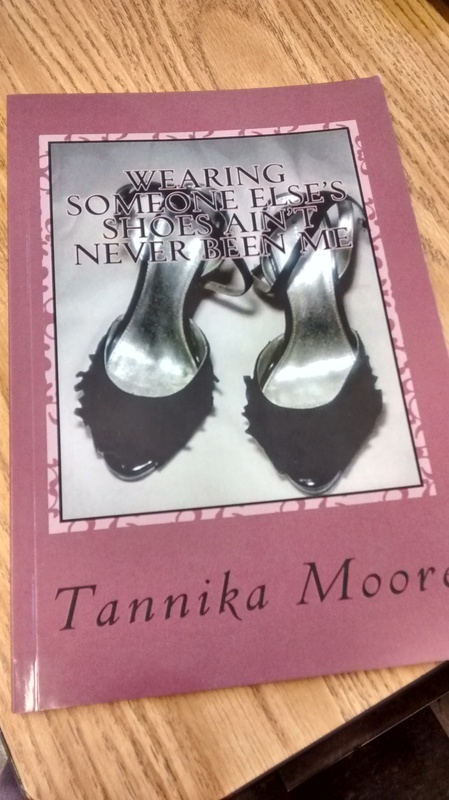 To purchase my book, Wearing Someone Else’s Shoes Ain’t Never Been Me, click here. Kindle version also available, click here. Trust God and Set The Captive Free! This entry was posted in Destiny, Walking In Your Own Shoes. Bookmark the permalink.